Students can take advantage of an extensive set of curricular opportunities that allow them the flexibility to sample according to their interests or dive deep. 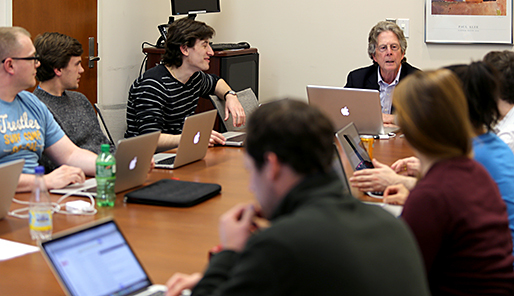 For students without a background in basic finance, accounting or other business methods, courses taught by UVA’s business and law faculty lay a foundation for understanding the corporate world. They include Accounting and Corporate Finance, Corporate Strategy and other classes focused on business skills. Core business law courses include Corporations, Securities Regulation, Bankruptcy, Employment, Environmental Law, Income Tax, Antitrust and Intellectual Property. Students who have taken the introductory Accounting and Corporate Finance course or who have equivalent experience are eligible to take enhanced versions of core Law & Business courses that incorporate finance and quantitative concepts. These typically include Corporations, Securities Regulation, Secured Transactions, Corporate Finance, and Mergers and Acquisitions, and are often taught by resident faculty members with graduate degrees in economics or finance. If you have a good idea of your interests or the areas of law in which you would like to practice, you should start to concentrate on more advanced courses in those areas, such as transactions, tax, securities, intellectual property, international or litigation. A list of courses recently offered is at the Curriculum and Advanced Courses website pages. Otherwise, select a mix of advanced courses from the transaction, litigation and regulatory areas. University of Virginia School of Law students negotiated a mock business deal with Northwestern University students this semester as part of a course offering a new, hands-on approach to learning. UVA Law professor George Geis spoke about how blockchain technology — the technology underlying Bitcoin transactions — could shake up more traditional asset markets.